Too cute! I am a huge sucker for snuggly socks, so I think that’s the one I would use! Although the warm spot in bed is good also! I love these! Adorable!!! 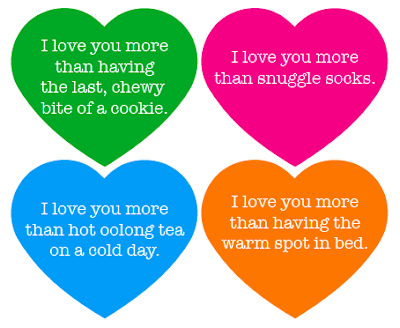 I want them to be printed on greeting cards! These make me smile. I remember a line from a silly song, a long time ago, that was “you’re like finding an onion ring in my french fries” and I thought that was the simplest, most fun way to tell someone you liked them. These remind me of that. Warm spot in the bed, that’s a good one! 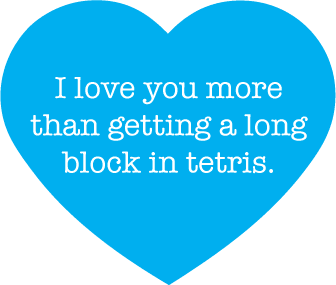 what i wanted to say was that…tetris is awesome, hearts are awesome and YOU are awesome.